The kid continues to shine. 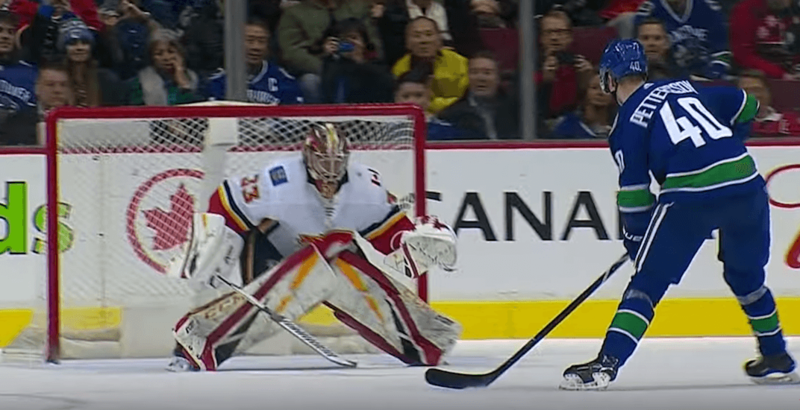 Canucks rookie sensation, Elias Pettersson, led his team to a 4-3 victory over the Calgary Flames on Saturday night after scoring the shootout winner in smooth fashion. “I was thinking high glove all the way,” Pettersson told a media scrum after the game. Sure enough, he wired a wicked wrist shot top corner, over the glove of Flames goaltender David Rittich. Canucks goaltender Jacob Markstrom, who made 44 saves on the night, shut the door on all three Flames shooters in order to seal the win. Bo Horvat, Josh Leivo, and Brock Boeser scored the goals in regulation for Vancouver. Along with the shootout goal, Pettersson also notched two assists during the game, bringing his season total up to 50 points (25 goals, 25 assists). With having played just 45 career games, Pettersson’s impressive stats puts him in some pretty elite company. He ranks behind only five other players in the last 30 seasons who have amassed 50 points in 45 games played. Although Pettersson was a standout on the night, when asked about his performance by the media, the young Swede was quick to say it was his netminder who was the hero of the game. “Marky played really good and kept us in the game for 65 minutes,” he said. The victory snapped a three-game losing skid for the Canucks (25-24-7), moving them into ninth in the Western Conference standings – one position outside the playoffs. The club will be back in action on Monday, February 11th, at home against the San Jose Sharks.